We were in Adare, Ireland with very dear friends. Mark and I decided to make dinner, so I bought a cookbook. Mark and I sat down on a park bench while the others were sightseeing and decided what to make for dinner. I picked out this recipe for Root Vegetable Cobbler to go with the Chicken with red wine, garlic and bay leaves, another great recipe that I will share as well. I did not have a rolling pin to roll out the Shortcut Pastry, so I used a wine bottle and we had one knife to share to cut up the vegetables and the chicken, but we made a great meal and had the best time ever! Shortcut pastry (recipe below) Make Shortcut pastry first so it can chill while you are preparing the vegetables. Lightly grease and flour a 8-inch diameter soufflé dish or an 8-inch round cake pan. I like the soufflé dish because mine is 4-inches deep. In a small pan, add the chopped onion and 3 ½ cups of water, along with the parsley stems, peppercorns and vegetable cube stock. Bring to a boil and simmer for 15 minutes. Strain the stock and set aside. In a large bowl, put all of the vegetables, toss in 2 tablespoons olive oil, scatter onto a sheet pan and roast for 10 minutes or until lightly browned. Remove sheet pan from the oven and reduce the oven to 350° F.
In a large oven proof frying pan, heat the remaining olive oil and sauté the finely chopped onion for 10-15 minutes. Add the stock, bring to a boil, and add all of the vegetables from the sheet pan. Add the herbs, (but not the chopped Parsley), season with salt and pepper and bring to a boil. Transfer to the oven, uncovered and bake for 20 minutes. Remove from oven and allow the vegetable mixture to cool slightly and add the chopped parsley. Lightly grease and flour your soufflé dish or cake pan. Roll the pastry into a circle large enough to overlap your dish or pan. Lay the pastry inside the dish or pan and add the vegetable mixture. There should be a little liquid along with the vegetables, if you have too much (more than a tablespoon), drain it off. Fold the pastry loosely over the top of the vegetables and bake for about 30-40 minutes, until the pastry is a light golden brown. Rub the flour and butter together with your fingers. Stir in the sugar and create a well in the middle, add the egg yolks and just enough water to form a ball with the flour mixture. 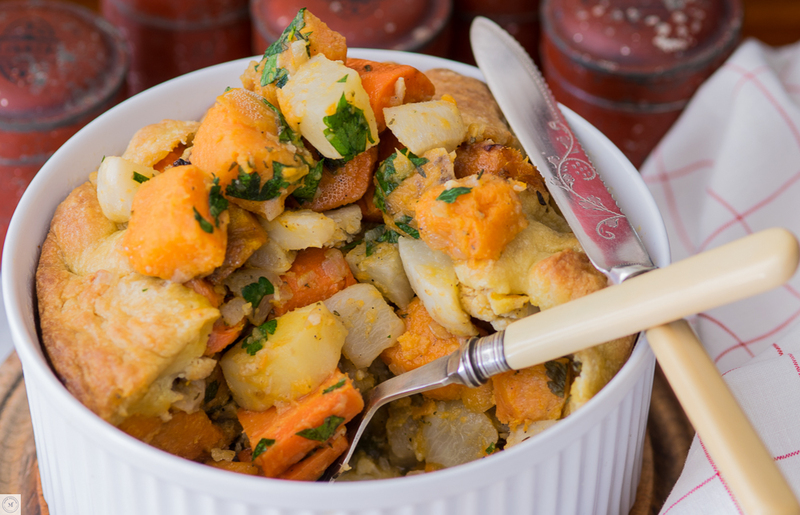 This recipe looks fabulous and perfect for those chilly evenings! We occasionally get those even here in Florida. I think of you often and hope you and Peter are well. Keep the recipes coming. They do cheer, just picturing you in your beautiful kitchen preparing them with love.